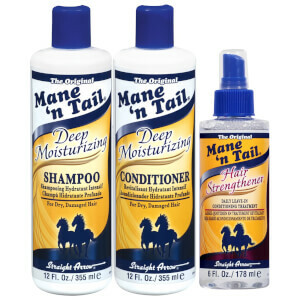 Treat your locks to the Deep Moisturising Shampoo and Conditioner from Mane 'n Tail. The duo work in tandem to cleanse and rejuvenate, whilst repairing dry, damaged hair and protecting against heat styling. A replenishing, regenerating formula that works to cleanse and hydrate dry hair. Harnessing the powers of Vitamin E and Pro-Vitamin B5, the lightweight shampoo gently cleanses the hair and scalp, whilst repairing damage caused by over-styling and environmental aggressors. You can expect soft, moisturised hair with restored shine. A weightless formula dedicated to repairing, strengthening and hydrating from root to tip. Fortified with natural proteins and vitamins, the rejuvenating conditioner replenishes lost moisture, improves elasticity, and combats the damage caused by heat styling and environmental factors. Restores soft, smooth hair with healthy-looking shine. Sjampo: Påføres i vått hår. Masser til det skummer og skyll ut. Balsam: Masser inn i ny-sjamponert hår. La virke i 1-2 minutter og skyll. Shampoo: Water/Aqua/Eau, Sodium Laureth Sulfate, Cocamide MEA, Sodium Isostearoyl Lactylate, Glycol Distearate, Glycerin, Cocamidopropyl Betaine, Sodium Chloride, Dimethicone, Hydroxypropyl Methylcellulose, Cocodimonium Hydroxypropyl Hydrolyzed Wheat Protein, Fragrance (Parfum), Polyquaternium-7, Guar Hydroxypropyltrimonium Chloride, Trideceth-6, Panthenol, Tocopheryl Acetate, Citric Acid, Sodium Hydroxide, Methylchlorisothiazolinone/Methylisothiazolinone, Blue #1 (CI 42090). Conditioner: Water/Aqua/Eau, Stearyl Alcohol, Cetearyl Alcohol, Cetyl Alcohol, Stearamidopropyl Dimethylamine Lactate, Behentrimonium Methosulfate, Cocus Nucifera (Coconut) Oil , Fragrance (Parfum), Cyclopentasiloxane, Glycerin, Dimethicone, Glycine Soja (Soybean) Oil, Isostearamidopropyl Morpholine Lactate, Olea Europaea (Olive) Fruit Oil, Panthenol, Tocopheryl Acetate, Hydrolzyed Wheat Protein, Methylchlorisothiazolinone/Methylisothiazolinone, Blue #1 (CI 42090), Yellow #5 (CI 19140), Butylphenyl Methylpropional.